She gets these notions, ken? What kind of belt buckle? It can’t go like that! and led me back up the hall. will you wear your kilt? Diana has a lot to answer for. But most of it is good. (cough) the pleat to the sett. Note the dates- It’s been nearly 18 months since I finished. He’s worn it ONCE before today, back for that final drooling fitting. Plainly I caught him in a moment of weakness today. 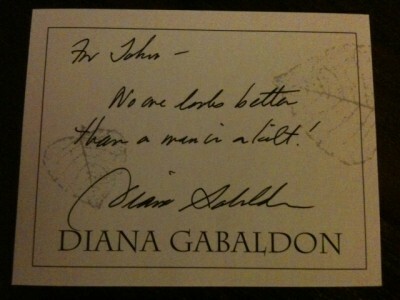 Or else he’s been reading Outlander again on his own. Good lad. Rock the kilt! I’m a Scot, and I wear the kilt regularly. I have four. One solid black wool for black-tie occasions, one in my Stirling family tartan wool, and two modern denim kilts for daily wear. I love them, gives the -ahem- boys room to breath. I’m sure you do! I’ve noticed there are Welsh kilts now. It isn’t traditional though, is it? I should like to see the back.—- you are a beautiful couple. Photogenic, the two of you. lol It will probably be a long time before I get him in it again, but I’ll try to remember to snap the view! He looks mighty fine in that kilt! What to do when I run out of superlatives?! 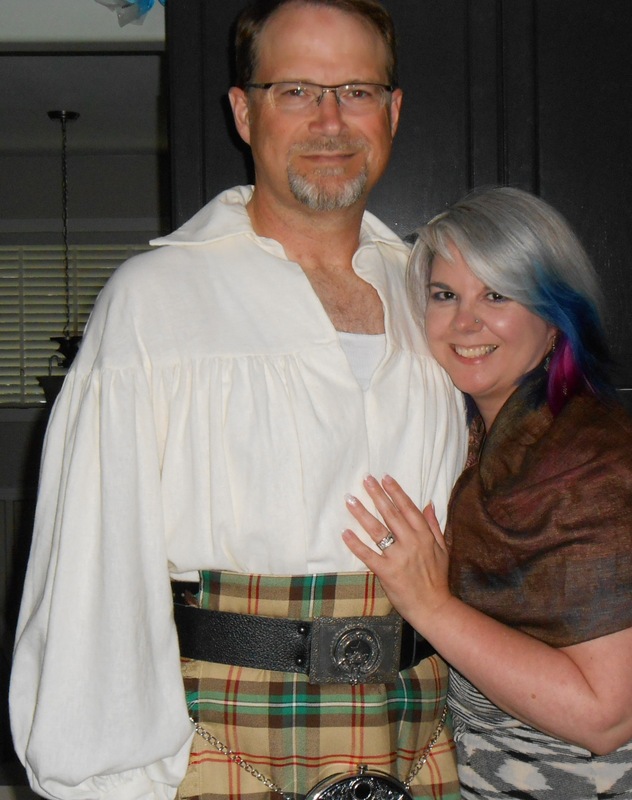 I suppose I just say, “How much would you charge for making me a kilt?” I don’t really want one, but my wife has some cockamamie wedding anniversary idea she won’t tell me about! : roll : Wonderful poem! This really warms the cockles of our Scottish hearts – especially Ian’s, for he is the bonafide, born and bred Scotsman. We love your poem. It is hard to imagine a Scotsman not wanting to wear the kilt. However, I’ll bet his five-great grandfather didn’t have to be talked into wearing one. You certainly did a great job of sewing, Shawn. I know I (Gayle) would not have chosen to try my hand at sewing one. Ian’s first kilt was furnished to him when he was an Army cadet in Scotland in the 1940s. Later as an airman and bandsman in the RAF he was in bands that wore “trews” instead of kilts. After emigrating to Canada, though, he was given a kilt by a friend of a Scottish relative. Even though he wasn’t of the Stewart Clan (the kilt bore the Royal Stewart tartan) he reconciled wearing it because he was Scottish and thus under the “protection” of the royals! Hah – such an admission from an ardent Scottish nationalist! In reality, the reason was that he liked the tartan and, of course, it was free!! 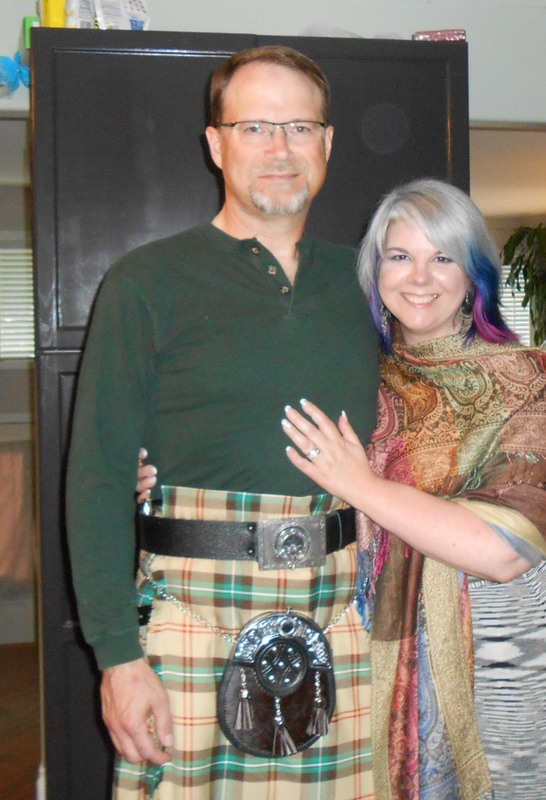 Nowadays, after undergoing many adjustments by me to accommodate his expanding girth and then his diminishing girth, we visited the Scottish Highland Gift Shoppe in Calgary last year and had him measured for a kilt in his family tartan – the McKinnon. ( The Morrans family is a sept of the McKinnon clan.) It cost us a pretty penny, too. We’ve used that tartan to help decorate the cover of Ian’s latest book, a memoir: From Poverty to Poverty: A Scotsman Encounters Canada.” By the way, we also love Diana Gabaldon’s Outlander books. Ian does cringe, though, whenever the so-called word “verra” comes up. He says he has NEVER heard “very” pronounced like that in all his years in Scotland or since. I wonder who was Gabaldon’s consultant on the Scottish dialect. Perhaps it was the online Scots dialect dictionary which did bring up a translation of “very” for “verra.” Ian thinks it must be a very obscure usage, though. He is a Highlander, also lived in the Lowlands for some years and has friends from all over Scotland and never heard that pronunciation. Anyone out there know in what part of Scotland the pronunciation “verra” is used?